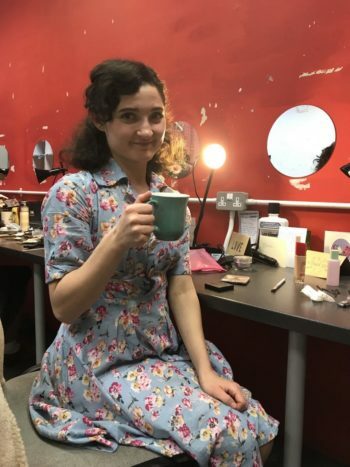 The play is based on the true story of Ethel and Julius Rosenberg, (fictionalised as Esther and Jakob Rubenstein) a devoted Jewish couple and a pair of communist idealists who were executed for allegedly giving atomic secrets to the Russians in the 50s. The play explores the impact of their decisions on their family through the generations. Its powerful and moving drama. I really love my interrogation scene with FBI agent Cranmer because my character Esther Rubenstein is really powerful and ballsy in that scene and that’s not often something I get to play. Being at the National Theatre when I was 19 as I met my best friend. It was also where I felt I peaked in my work in Dennis Kelly’s play DNA playing Leah. Inside: Philip Seymore Hoffman because he is the best actor ever… He could show such vulnerability on screen which you don’t often see in men. As well as a great character actor. Outside: Charlotte Bronti because she lived in the country and fought for what she wanted in a Male Diminated world. The story is such an interesting tale that is poignant for the audience. It is story of sensuality, sexuality and betrayal. It examines the impact of choices people can make and whether an idea can really outlive us.